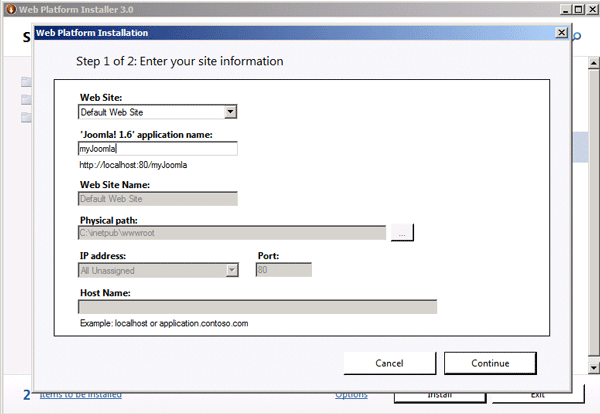 This article describes how to install and configure Joomla 1.6 on Windows Server 2008 R2 by using the Microsoft Web Platform Installer (Web PI) version 3.0. The Web PI is a free tool that makes getting the latest components of the Microsoft Web Platform—including Internet Information Services (IIS), MySQL, the Microsoft .NET Framework, and Visual Web Developer—quick and easy. 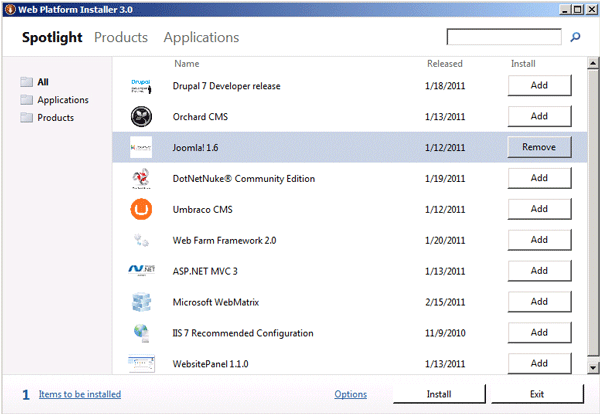 The Web PI also lets you install web applications such as Joomla by using the built-in Windows Web Appl Gallery. The supported operating systems for the Web PI 3.0 are Windows 7, Windows Vista Service Pack 1 (SP1), Windows Vista, Windows XP Service Pack 2 (SP2) and later versions, Windows Server 2008 R2, Windows Server 2008, and Windows Server 2003 Service Pack 1 (SP1) and later versions. For this guide, it is assumed that you have Windows Server 2008 R2 installed on your computer. You will also need an Internet connection and administrator privileges for your computer. 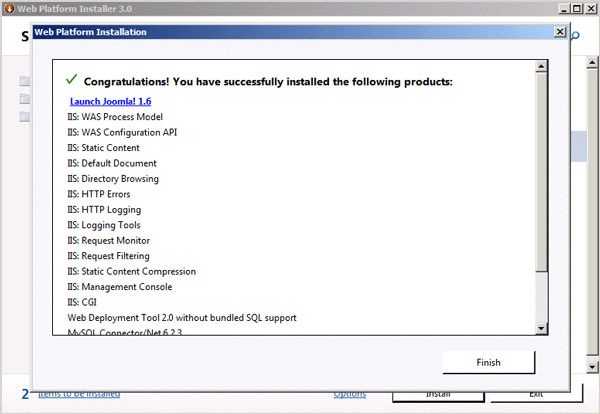 It is a good idea to confirm that your system meets the hardware requirements for IIS 7.0. See http://technet.microsoft.com/en-us/library/cc268240.aspx for more information. In this step, you begin to install the Web PI 3.0, which is a 1.3 MB download. 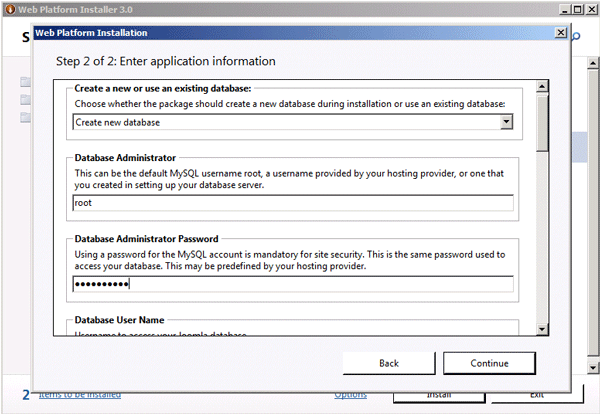 Log on to Windows Server 2008 R2 as a user who has administrative privileges. 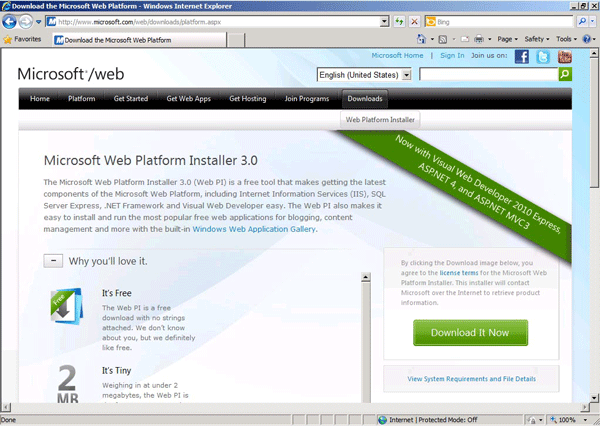 Go to http://www.microsoft.com/web/downloads/platform.aspx, and then click Download It Now. Wait a few seconds for the Web PI to start. In this step, you select the version of Joomla that you want to install. Joomla 1.6 is used in this guide. Next to Joomla! 1.6, click Add. Note: If Joomla! 1.6 is not in the items list, click Applications in the left navigation pane. In this step, you review and configure what you have added. Additionally, you add the database, name the MySQL database, and name the Joomla 1.6 site. When you are asked which type of database you want to use, leave MySQL selected. 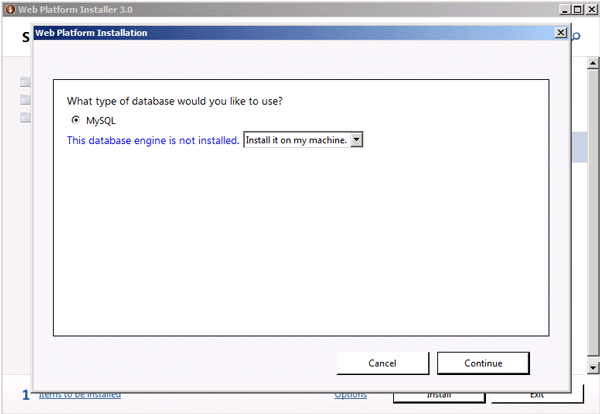 Note: This will install MySQL 5.1 for Windows to handle all the database transactions that are required by Joomla. In the list, select Install it on my machine, and then click Continue. 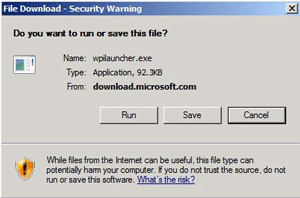 Note: Windows Cache Extension is used to increase the speed of PHP applications that are running on your web host. 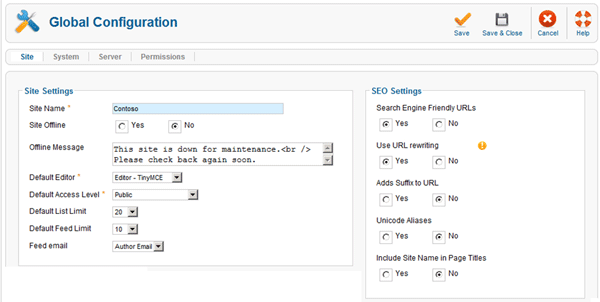 IIS URL Rewrite allows search engine friendly URLs to be enabled for Joomla. 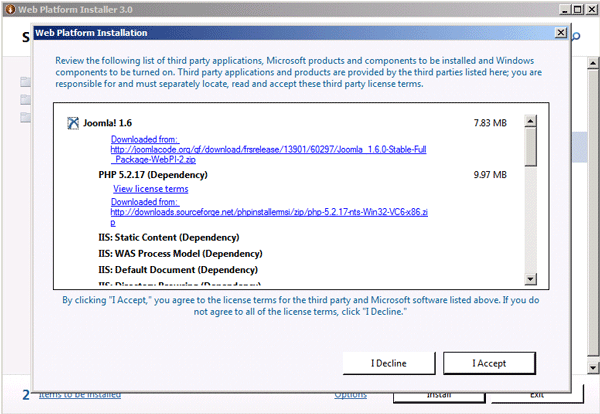 Review the files to be downloaded and installed, as well as the license agreements, and then click I Accept. 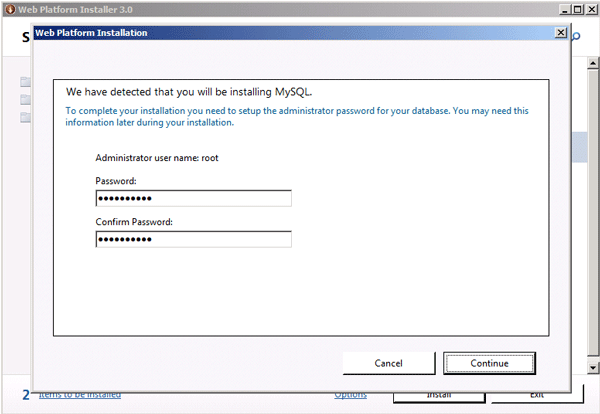 Specify a password for the MySQL administrator user name (root), and then click Continue. Note: It is important to remember this password because you will be asked for this password in the steps that follow. Allow the Web PI installation to complete. In the Web Site box, leave Default Web Site selected. In the 'Joomla! 1.6' application name box, type a name for the Joomla 1.6 site, and then click Continue. For example, type myJoomla. 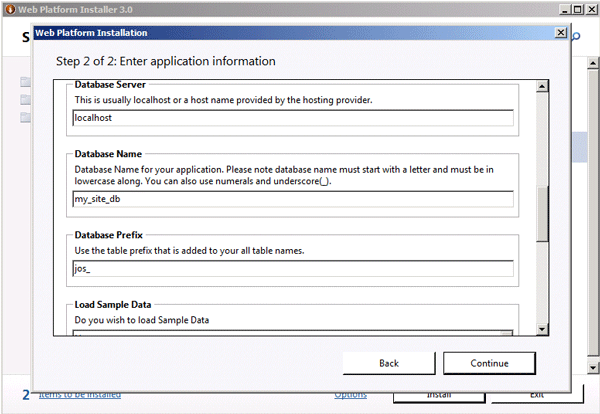 Leave Create new database selected. 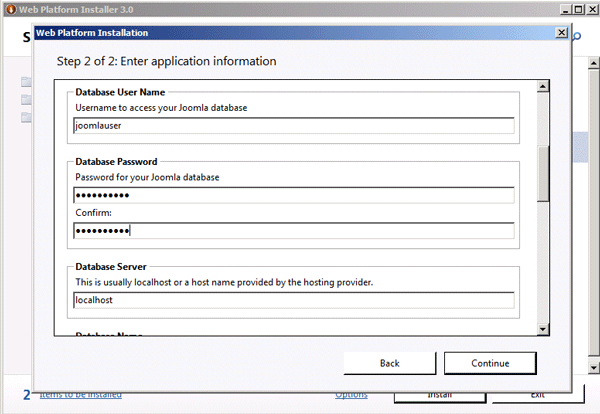 Type the database administrator user name (root) and password. Note: This account is used to create and manage the database that is needed for Joomla. Note: Joomla will use this account to access and write to the database as needed. Type the password for the database user name, and then scroll down. Leave the default database server name, localhost. The database name and database prefix can be used as is, or you can rename them. 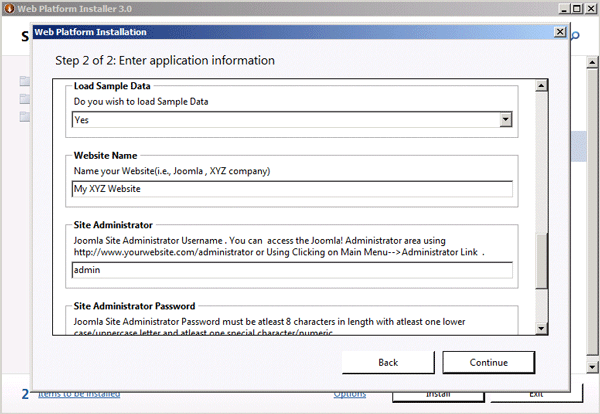 In the Load Sample Data list, select Yes or No to install Joomla sample data. Note: We recommend that you install the sample data and remove items as you create your data. Type the name of your Joomla website. For example, type myJoomla. 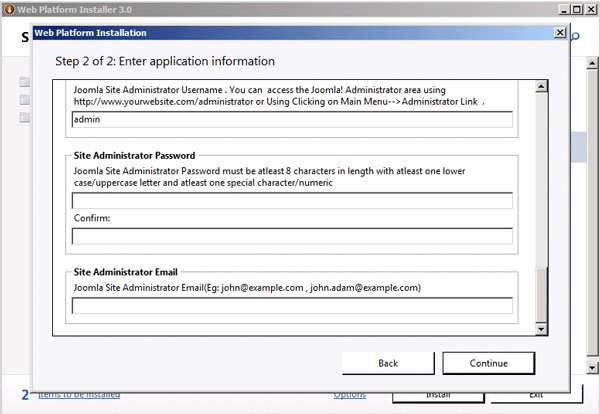 In the Site Administrator box, type the Joomla site administrator user name. For example, type admin. 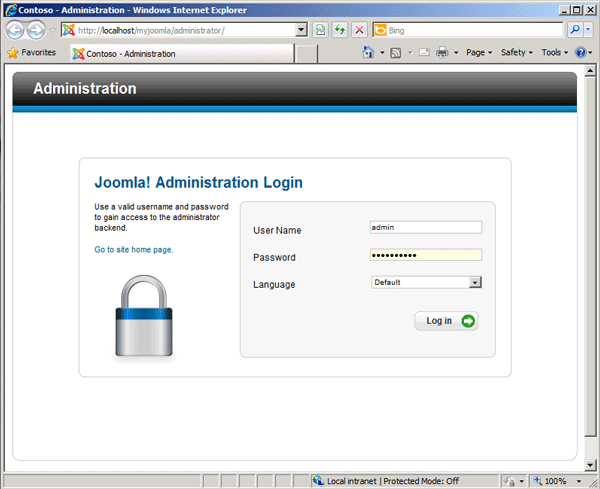 In the Site Administrator Password box, type the Joomla site administrator password. In the Site Administrator Email box, type the email address that you want to use for the Joomla site administrator, and then click Continue. Click Exit to close the Web PI 3.0. In this step, you verify the installation and browse the Administration page. Go to your Joomla website. For example, go to http://localhost/myJoomla. Scoll to the bottom of the page, and then click Site Administrator. Log on by using the Joomla site administrator user name and password that you created in the previous step. In this step, you verify that search engine friendly URLs were automatically enabled, and you enable progressive caching for Joomla. 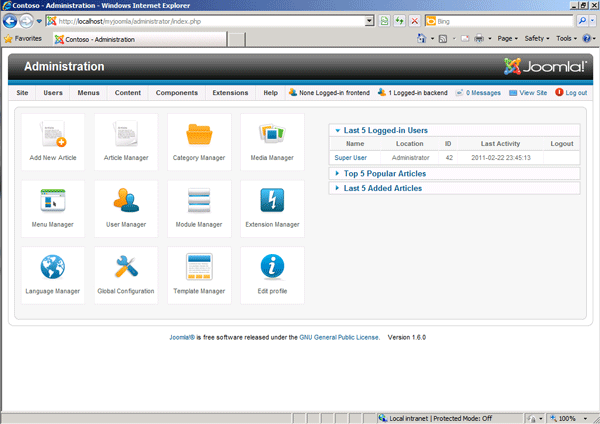 On the Administration page, click the Global Configuration icon. Under SEO Settings, confirm that Search Engine Friendly URLs is set to Yes, and confirm that Use URL rewriting is set to Yes. Under Global Configuration, click System. In the Cache list, select ON – Conservative caching. In the Cache Handler list, select Windows Cache. Click View Site to go back to the default page, or begin managing your Joomla site. 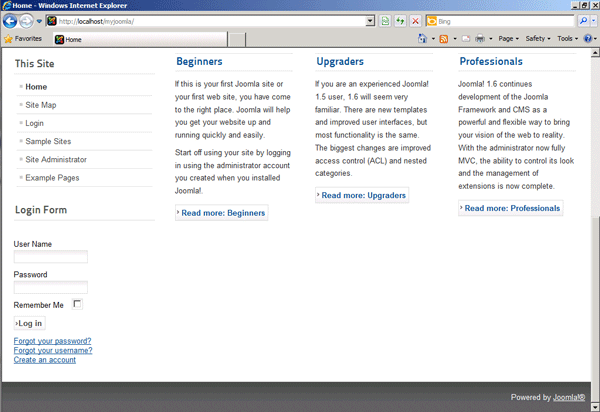 The installation is now complete, and you are ready to use Joomla! This page was last modified on 23 May 2011, at 15:19.